Weinstein's first industry-wide penalty came from across the pond. 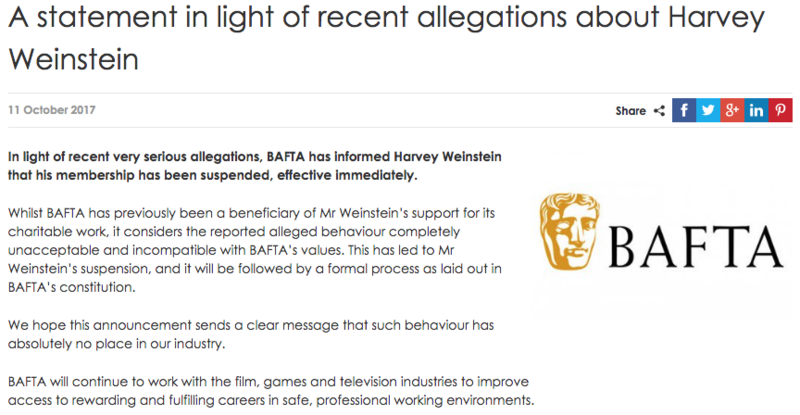 In the first industry-wide consequence of more than two dozen women claiming sexually harassment or assault by Harvey Weinstein, The British Academy of Film and Television Arts [BAFTA] has suspended the producer’s membership. Stateside, it remains to be seen whether The Academy or the PGA will similarly punish Weinstein, whose Oct. 8 firing from The Weinstein Company — the studio he founded with his brother in 2005 — was bookended by dueling, devastating investigations in The New York Times and The New Yorker. The BAFTA Awards have been presented in London since 1949, typically each May. Two of Weinstein’s films, “Shakespeare in Love” and “The King’s Speech,” won the evening’s top prize. Weinstein and Burberry Creative Director Christopher Bailey traditionally host a pre-BAFTA Award fete sponsored by Grey Goose. The year “The King’s Speech” triumphed, The Telegraph reported that at this party, an editor had a drink thrown at him over an article about Rupert Murdoch’s daughter, Elisabeth; the thrower was her husband. Three of Weinstein’s current accusers — Lauren Madden, Romola Garai, and Emily Nestor —say he harassed them in London hotel rooms. TWC opened its first international office there in 2011.